Japanese organising consultant Marie Kondo set off a decluttering craze across the world with her pocket-sized book, The Life-Changing Magic of Tidying Up. After reading the book, it's easy to see why. This book can transform the way you see your possessions. This is part of Lifehacker's book review series. Not every life hack can be summed up in a blog post, so we've decided to review some of our favourite life-changing books for deeper dives into life's most important topics. If you've ever struggled to part with a memento or a gift, if you're tired of being owned by the things you own, or if you've ever considered hiring a personal organiser, this book might be for you. I say "might" because Kondo's "KonMari" method is at times extreme, and while her writing is charming and funny, the advice is quite zany sometimes. (Advice such as "thank your socks as you roll and put them away" or "think of your bras as having souls.") If you're willing to just go with it and let Kondo into your mind, so to speak, you'll likely find this is the book that pushes you from "wanting to declutter" to actively tidying as a path to a more serene home. Finish discarding first. This is the cornerstone to the KonMari method. Do a complete purge of everything you own, evaluating each on the basis of whether it sparks joy for you or not. She explains how you have a relationship with every object you own, but if you don't need some of them in your life anymore, you can thank them for their service and get rid of them guilt free. Instead of thinking first "what should I get rid of? ", however, you'll be thinking "why should I keep this?" Tidying by category works like magic. Instead of tidying by one room at a time, Kondo advises we tackle clutter by category instead, in the following order: clothes, books, papers, miscellany, and then things with sentimental value. You'll put all your clothes on the floor and sort through them, all the books you own in one spot and sort through them, and go through all the "komono" (things you keep "just because", like small tools or accessories or those electronic cables you can't identify anymore). Storing your things to make your life shine. This section is about storing the stuff you do decide to keep with respect, in the best way to see and appreciate them. Lifehacker readers will probably be familiar with the advice to "file" your clothes. Kondo offers other suggestions, such as storing bags within bags, decorating the back of your closet, and keeping bath and kitchen items stored outside of the bath and kitchen sink area (to avoid grimy buildup). The magic of tidying dramatically transforms your life. The goal is to be surrounded only by the things you love (or need) and to be inspired by your possessions rather than stressed out by them. This section walks you through the importance and benefits of letting go. The one thing you'll hopefully get from this book is a desire to get rid of the things that don't make you happy. I've long wanted a less cluttered, better-organised house, but that's also been in sharp conflict with my security-seeking desire to hold onto things I might need "just in case". I have my fair share of sentimental and aspirational purchases too, like knitting supplies for that time I might one day take up knitting. Reading The Life-Changing Magic of Tidying Up is like having a consultation with a psychologist who specialises in clutter detox and who will convince you by the end of the session to really want less stuff. You're not going to look at them again, and even if you do, it won't increase the amount of money in the bank, so, really, get rid of them. Perhaps the most important section is the advice on gifts you've received and other sentimental items — the things that are hardest for us to part with. The book helps you release gift guilt by emphasising that the purpose of a gift is to be received — a way for the gift-giver to convey his or her feelings to you. That purpose filled, you can part with it without guilt. 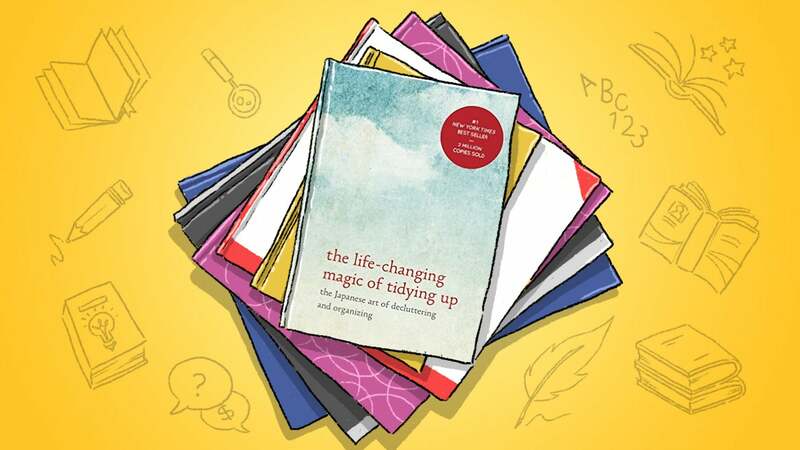 The Life-Changing Magic of Tidying Up is a charming and unique book on a popular subject. All decluttering or organising books share the same themes of only keeping what's worthwhile, but Kondo puts a sharper lens on each kind of object you might be holding onto, from your clothes and extra kitchen utensils to photos and other mementos. It can help you become ruthless in purging your possessions so you're only surrounded by things you love. That said, it's not for everyone and some of the advice might strike you as unrealistic, wasteful, and/or just plain crazy. For example, as an English major and avid reader, I'm especially horrified by her advice to get rid of all your books except the couple dozen or so that belong in your personal Hall of Fame. Her premise: even with books that give you pleasure and you might want to read again, you'll likely never reread them, so get rid of them. The same, I think, goes for her advice to: get rid of guest bedsheets and pillows if you only have house guests once or twice a year, discard all unidentified electronics cables, and get rid of all electronics boxes. The KonMari method is also an extreme makeover: You're supposed to do your entire home at once. This might be possible for some, but in my multi-person household and with several floors of rooms to cover, it's just unrealistic unless the crew of some decluttering TV show wants to come over and help us clean out. Still, this book is less about how to organise or purge your things (although it does offer guidance on both) than it is about learning how to let go of them. Clearly it's become a kind of cult classic because it really drives home how we'd be happier with fewer things. Getting to that realisation with a quirky personal organiser by your side (so to speak) is pretty life-changing. The Life-Changing Magic of Tidying Up: The Japanese Art of Decluttering and Organizing is available for $19.20 on Book Depository. A follow-up book, Spark Joy: An Illustrated Master Class on the Art of Organising and Tidying Up, is due out on 5 January 2016 and will offer more step-by-step directions for tidying up various categories of stuff in your home.